We’d love your help. Let us know what’s wrong with this preview of Life beyond Earth by Gerald Feinberg. To ask other readers questions about Life beyond Earth, please sign up. 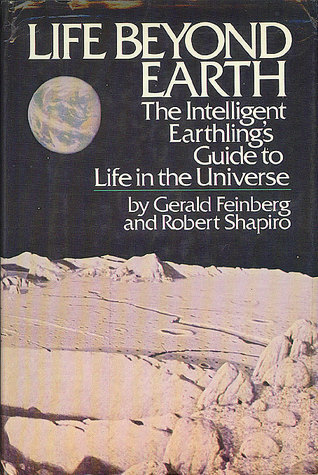 This book provided a lot of interesting ideas about the possibilities for life in the universe. But I couldn't help but be reminded of a song parody about Star Trek featuring the voice of Spock saying "It's life, Jim, but not as we know it." Because this intellectual exploration primarily addresses the possible existence of life forms that are far removed from what we think of as life. Entities that exist on the surface of stars themselves, for example, composed of plasma, preserving and replica This book provided a lot of interesting ideas about the possibilities for life in the universe. But I couldn't help but be reminded of a song parody about Star Trek featuring the voice of Spock saying "It's life, Jim, but not as we know it." Because this intellectual exploration primarily addresses the possible existence of life forms that are far removed from what we think of as life. Entities that exist on the surface of stars themselves, for example, composed of plasma, preserving and replicating ordered patterns through magnetic interaction. Or maybe life exists within huge gas clouds, or deep in the cores of terrestrial planets like our own, under conditions of incredible pressure. Maybe. All the speculation on alternative life forms is very interesting, but these weird gas beings are never going to come to Earth and ask us to take them to our leader. I can only hope that if those more traditional and familiar aliens do show up, that they address that request to someone with some sense, otherwise they'll end up sitting down with Glenn Beck. And then doubtless conclude that their own search for other intelligent life in the universe was an abysmal failure. Even though some of the science in this book may be dated, the intellectual exercises here are still of great value. The wonderful variety of life possibilities are explored and the reader is forced to abandon preconceptions. Great read for the inquisitive mind. This book is explains the possible variations of life on other planets, covering even more exotic forms such as lifeforms living in nebulas or stars. While its scientific explanations are simplistic, it was highly entertaining, informatative and inspiring for me as a child.